To verify if two (or more) males share the same paternal line. To verify if two or more brothers have the same biological father. If you wish to know if two brothers also have the same mother, you will require a Kinship Test. Best option for a test between paternal grandfather and grandson. 23 DNA regions of the Y chromosome will be tested, providing an accuracy rate higher than 99.9999%. The Y Chromosome Test can even be used to verify a different relationship between any two males in the same family (although always following the same paternal line), even if the alleged relationship is more distant. For example, a test between uncle and nephew, or a test between cousins. How is the Y chromosome inherited? Men have one Y chromosome and one X chromosome (while women have two X chromosomes and no Y chromosome). 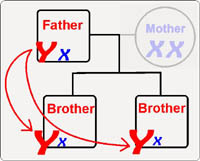 The Y chromosome is inherited from father to son, as shown on the picture. This means that all sons of the same father will present the same Y chromosome. Those sons will also pass that Y chromosome to their male children, so that grandfather and grandsons will also share that same Y chromosome. However, it also means that, as all men in the same family have the same Y chromosome, this test cannot pinpoint the exact relationship on the individuals tested. And it also means that this test cannot be done when the individuals to test may have a blood relationship on the paternal side other than the one they seek to verify with the test. The price indicated above is the final price for the analysis of 2 people with standard samples.